What Does Code P0455 Mean? OBD II fault code P0455 is a generic code that is defined as “EVAP System Leak (No Purge Flow or Large Leak) Conditions”, and is set when the PCM (Powertrain Control Module) detects a large leak in the EVAP (Evaporative Emissions Control) system. NOTE: Note that on Nissan applications this code has a dual definition, in the sense that it can either indicate a large leak (as opposed to small leak) in the EVAP system, or a fault, failure, defect, or malfunction in the EVAP system that is preventing the flow of fuel vapors to the engine. Also, note that while this code can occur on any OBD II complaint application, it occurs more commonly on some Nissan applications than on almost any other application. When the EVAP system is not in purge mode, both the vent and purge valves are closed, which has the effect of sealing the fuel system off from the atmosphere. As the fuel generates vapors, the vapors are absorbed by the activated charcoal in the charcoal canister until the vapor pressure approaches a predefined limit. When this happens in a fully functional system, the ECU opens both the purge valve and the vent valve to allow engine vacuum to draw the accumulated vapors into the engine. Note that the purpose of opening the vent valve is to allow atmospheric pressure to assist in “pushing” the collected vapors from the charcoal canister. As stated elsewhere, code P0455 can also indicate a condition in which no fuel vapors flow through the system. 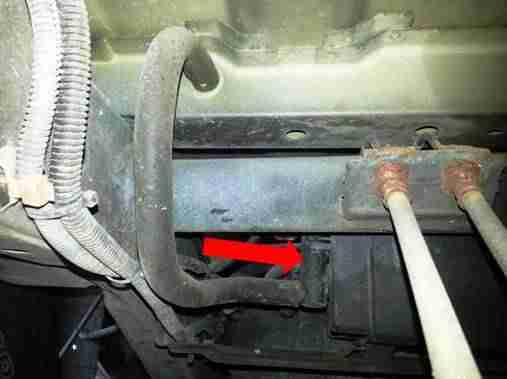 In these cases on Ford applications, the most common cause is a defective charcoal canister vent valve that is stuck in the closed position, thus preventing engine vacuum from evacuating the EVAP system. Note though that this condition will almost certainly be indicated by one or more codes that relate directly to the vent valve and/or its control circuit(s). While the presence of a leak in the EVAP system will generally not affect drivability, a leak will cause code P0455 to be stored and a warning light to be illuminated. Be aware though that if the code indicates a “no EVAP flow” condition (depending on the nature of the problem), the fuel vapor pressure may build-up to the point where hoses and lines may rupture, which may cause large quantities of fuel to leak from the tank. Note that with either condition, the application may also not pass a compulsory emissions test, because the EVAP monitor will not run or complete. So why does code P0455 affect some Nissan applications more than others? On some Nissan and Infiniti models, especially Altima, Rogue, Versa, Pathfinder, and QX4 models, code P0455 is most commonly caused by a poorly designed EVAP vent valve. However, while Nissan has released a redesigned vent valve, it has not done so for all affected models in all markets, which means that some older Nisan models from the 2005-2007 production years may still be fitted with the old-style vent valve. It is worth noting though that Nissan has released an upgraded filter kit for the EVAP vent valve on Pathfinder models from the 2005-2007 production years, which should resolve code P0455 on these models if the code was caused by a poorly designed EVAP vent valve. Where is the P0455 sensor located? The image above shows the typical location (arrowed) of the charcoal canister and vent valve on most Nissan models. Note that on affected models the vent valve is incorporated into the charcoal canister, meaning that the vent valve cannot be replaced separately. What are the common causes of code P0455?